From left to right are Great Valley Studio Manager/District Video Producer Kevin Fitzpatrick and students, Jacob Mingis, Jacob Hoover and Isaiah Cunningham. The fourth member of the winning team, Sarah Liu, is not pictured. 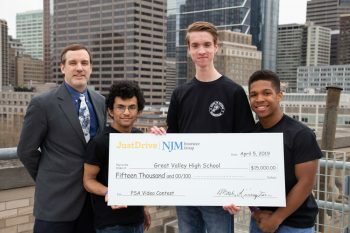 · First Place: Great Valley High School (Malvern, PA) won $15,000. Its PSA highlighted that a one-second decision to check your phone or tune the radio while driving can have devastating lifelong consequences. · Second Place: Hempfield High School (Landisville, PA) won $10,000. Its PSA provided helpful tips for avoiding cell phone use while driving. · Third Place: Elizabethtown High School (Elizabethtown, PA) won $5,000. Its PSA illustrated the impacts of an accident caused by a distracted driver. The winners were announced in conjunction with Distracted Driving Awareness Month and celebrated with a screening party at the Franklin Institute in Philadelphia, PA. Attendees had the opportunity to view all three winning entries, alongside a montage of all 34 entries.